"The use of traveling is to regulate imagination by reality, and instead of thinking how things may be, to see them as they are," said 18th century English author Samuel Johnson. Three hundred years later the saying still holds true, only our imagination now is inundated with internet and television glimpses of the distant reality. The great paradox of my generation is that traveling has never been easier but technology has at times eliminated young adults' need to discover by physically going. It is technology that enabled travel to become easier, but technology might just be what is keeping us stagnant. A picture may say a thousand words, but nothing replaces that speechless feeling of being consumed by the real scenery of a world not your own. I tell any of my friends who have ever considered studying abroad through the business school to make sure they find a way to actually go. The international MBA provided me a rigorous and relevant curriculum at the same time giving me the opportunity to develop relationships I hope to maintain for a lifetime. 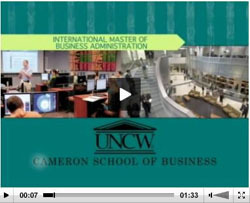 UNCW's IMBA program is still young and growing, but it is these three important "R's" that give me confidence to recommend the program: rigor, relevance and relationships. Academically, the rigor of the program pushed me. There were many sleepless nights at Universitat de Valencia, Spain, most of them for studying, some of them a necessity of Spanish culture. With the program condensed into about one year, you get more information at higher speed than ever before in your academic career. I believe that my ability to observe, filter, take in and apply knowledge at an incredible pace will be an important asset to my future employer. A mentor of mine once compared an MBA to drinking from a fire hose. While I will not be boasting the ability to drink from a fire hose on my resume, I now understand what he meant. The program is incredibly relevant. Small class sizes and keen minds of our professors gave us the opportunity to discuss the world and its current issues from a business standpoint in a way that was insightful to all, even the professors! When you put people from 10 or more different countries in one classroom and begin to dissect issues like globalization, financial crisis, credit or trust, then explore how our cultural reactions to people and information are major factors in both the cause of the problems and the eventual solutions, school moves from memorization to critical thinking, passionate problem solving and relationship management. You learn not to just accept the opinions of foreign ministers that you hear about on the news, but to truly consider the ways people of different countries view things and what you can do to make business better. Many people say business is about relationships, and in fact I once was tempted to believe a student who said, "It's not about the grades you make, but the hands you shake." What people who tout that motto fail to realize is that rarely do people like to shake hands with low achievers, and even more rarely do people with low grades get very far in business leadership. The beauty of an international MBA is that you are gaining important friendships, and you can be assured that they are all high achievers! I consider myself so blessed to have made the friends I have now and to have learned the things I learned from them. I never dreamed I would be able to hold conversations with people in the business world by quoting the viewpoints of my friends from over 20 different countries, places as well known as world economic power Germany and places I must admit were unknown to me before, like Azerbaijan. The uniqueness of going to two different schools for the IMBA gives you even more chances for new relationships. The International MBA program has given me the opportunity to show my future employer that I can handle the most rigorous work, creatively solve relevant issues with cultural sensitivity, and relate to a diverse array of people. As we operate in ever increasing globalization, I am confident that my international experience allows me to walk into a potential employer and say, "I'm ready."